Been a while since I as here last, thank you to all those who checked in after me. Things are ok and I am doing well. Had to take a forced break as work got intense and I had voluntarily added something to my list to be completed by year end. Target complete and here I am with a couple of alphabets to add to the end of my name on my professional signature :-). It was mentally exhausting and physically difficult to go back to some serious school age studying (which obviously I had not done in a long time) but gratifying at the same time. DD has been equally busy the last week as she is going through a series of exams before her winter vacations start and then will have to get ready for the exams after the vacations :-(. I was completely drained last evening and dozing off at 6.30 in the evening while she was still chirping away and working on her homework. I asked her how she does it and she looks me in the face and quips, "Amma, do you realize you are old? ", cheek of the kid to call her own mom old, I never said anything like that to my parents, EVER :-). Well, I promise I wont bore you with too much non foody stuff. Here I am back and rearing to go with my blogging. A couple of days ago Srikanta Datta Wodeyar passed away, for those of you unfamiliar with who he was, this can't be more than another piece of news. He was the last of the Wodeyar dynasty which ruled Mysore province for generations. For me, he is part & parcel of my Mysore Dasara celebrations. Though he never was a maharaja (king) in the true sense of the word as post Independent India did away with kings & royalties, he represented a bygone era. Government had made provisions for this crown-less, throne-less king to live in the Mysore palace and also kick start the traditional Dasara procession with a pooja. Now, he becomes only a memory and a tiny bit of history that enriched the region. For me, food blogging has been all about memories, remembering not just the taste of the food but the people who made them, served them, company you enjoyed with and incidences they were part of. This means that I talk about my family and personal life many times on this blog. Hope you enjoy reading them as much as I do writing them. I have a very homely recipe today that you will not find in any restaurants ever, sometimes simplest of the things make the most sense, bring absolute joy and contentment in life. When you reach the western ghats in Karnataka and stop at someone's home in a place such as Chikmagaluru or Shimoga or further interior at Balehonnuru, the food takes on a completely different shape, flavor and taste. I believe the taste is enhanced because it is made with ingredients locally grown or available and not tainted by long journeys packaged and shipped from a different part of the World. While it limits the ingredients available to you, your chef's ingenuity shines bright as you come up with so many variations unrecognizable from the previous one. This region is known for its Tambulis (yogurt based cooling gravy), chutneys (abundant use of ingredients such as banana stem, banana flower etc), or the very unique saasve which is generally a gravy either with or without vegetables but definitely with ground raw mustard. One of my friends is from malnadu and married into a family in the deepest part of the region, so all her strings to Malnad food are intact. 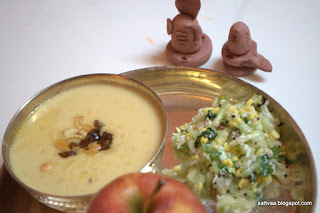 On one of my India visits, she made this saasve which was out of the world and brought back memories of having tasted it in my Doddamma's kitchen once. So I went right after her for the recipe and recreated it at home and here is a much loved menthya saasve for all of you to enjoy. It makes a great side dish for rotis also but you can go ahead and create your own Malnad experience by spreading a green banana leaf and serving it with hot white rice. Mix it in with a drop of ghee and enjoy. Come back and let me know if you were able to stop licking your fingers anytime or even smelling the fingers after you had washed them :). 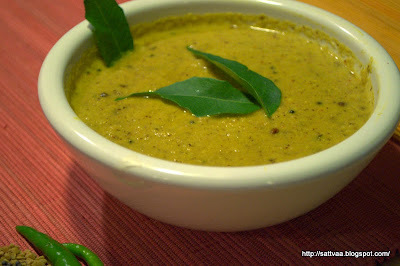 Saasve (or saasive) means mustard in Kannada. Keeping the ground masala same, there are umpteen varieties of this saasve as you can use different vegetables in place of fenugreek seeds. The one I have today is bisi(hot) saasve as the masala is boiled after it is ground. There are hasi (raw) saasve varieties where you just add the ground masala to a vegetable (raw such as cucumbers or radish) or to a cooked vegetable (such as fried okra) along with a ladle full of yogurt. May be I will post one of those some other time. I haven't used any vegetables today and the surprise ingredient is fenugreek seeds, no I didn't make a mistake when I said 2 Tblsp of fenugreek but I will tell you this - you wont bite into any bitterness here, the seeds lose their bitterness in this dish, instead lend a wonderful aroma and taste to the dish and makes it very delicious. Remember to keep the salt, spices and sourness in balance and to your liking. Enjoy! What do you need to make Menthya saasive? How do you make Menthya saasive? 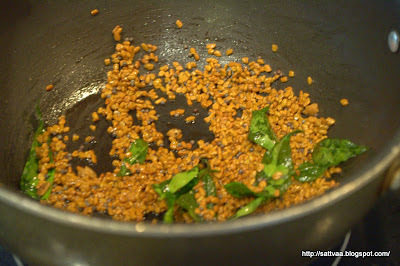 Heat oil in a pan, add mustard and fenugreek seeds. 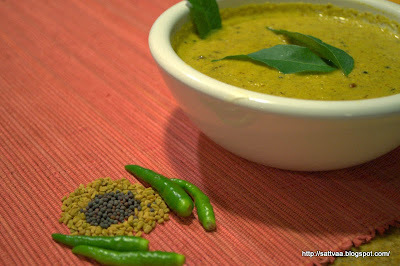 Keep the heat on medium to low and fry the seeds stirring frequently until mustard pops and fenugreek turns deep brown. Take care not to burn either of them. Add the curry leaves and stir it in. 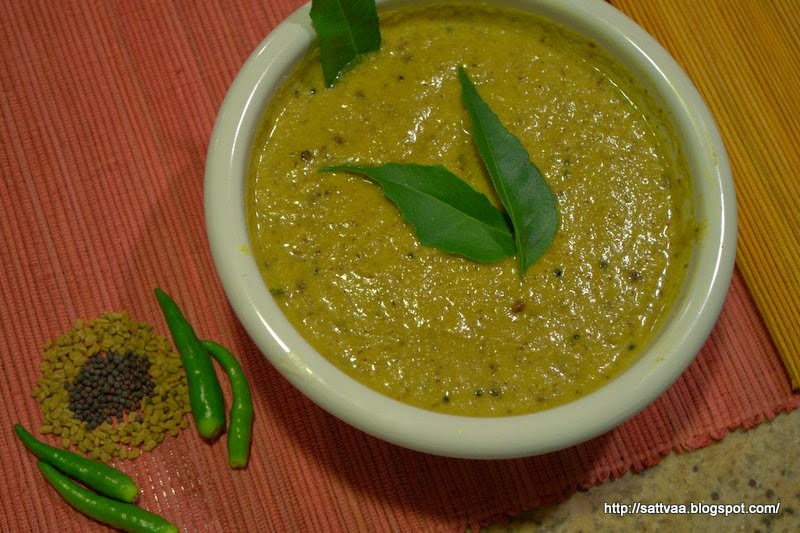 Mean while prepare masala - grind all ingredients under 'To grind' with 1/2 cup of water into a very smooth paste. 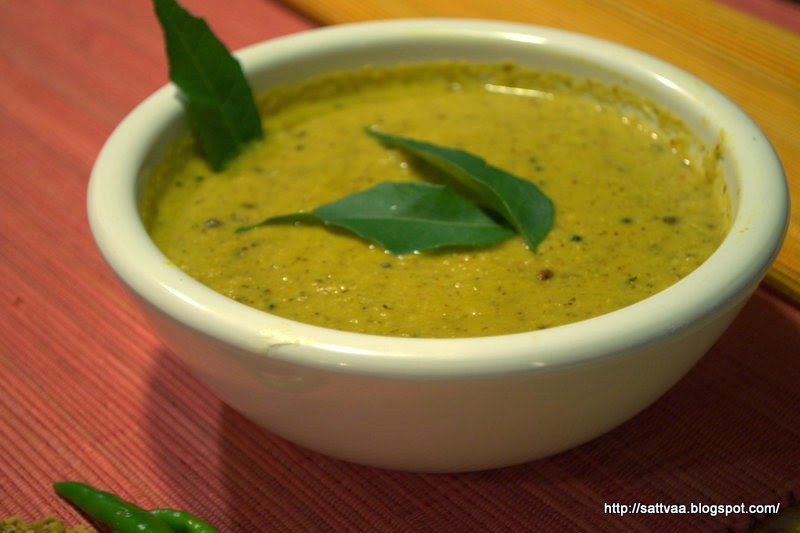 Add the ground paste to the roasted fenugreek, add water to make a thin gravy consistency and let it boil on low heat for 10 minutes or until fenugreek seeds drink up the masala and plump up. Switch off, let it stand for about 20 minutes before serving with rice or rotis. 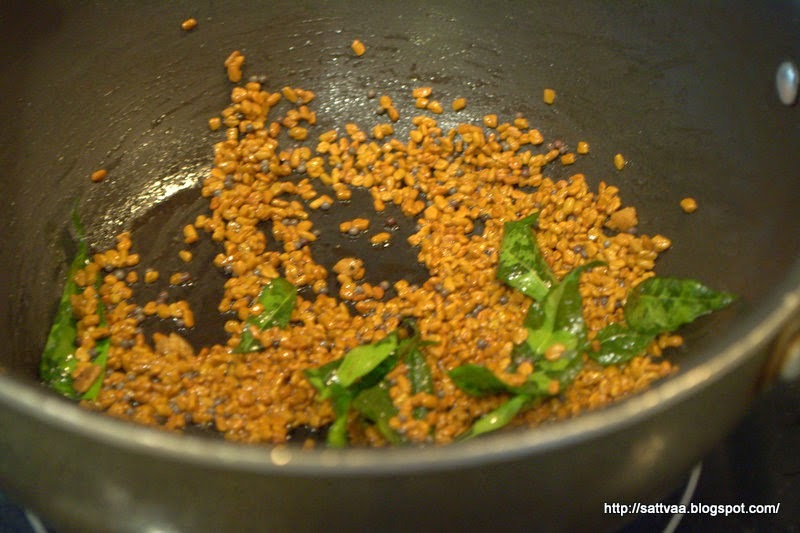 It is important to roast the fenugreek on low-medium heat so the seeds get roasted through. Taste the ground masala and adjust green chilies, salt or tamarind as needed. This is yummy by itself as a chutney. 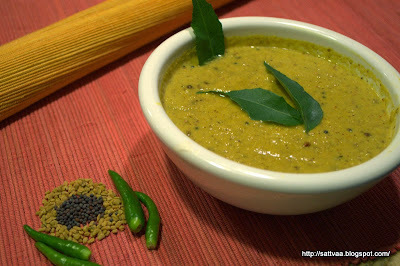 You can use dry red chilies in place of green chilies to make a 'kempu saasve'(red gravy) as we called it. 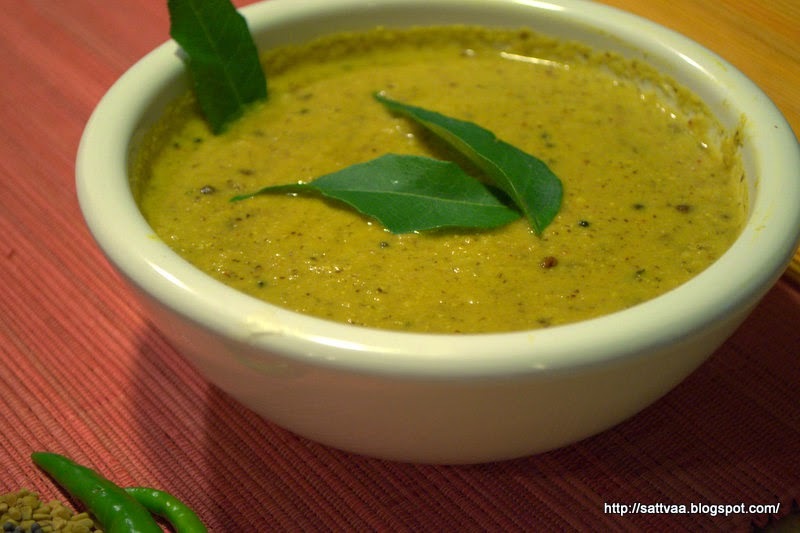 The gravy is a blend of sweet, sour, spice and saltiness. Adjust them to suit your palate. It is important to let the roasted fenugreek boil in the masala and soften before you eat them, this process allows them to soak up the gravy, become soft and lose the bitterness. It is no fun biting into crisp, bitter fenugreek seeds. wonderful recipe . colorful picture. yes..it is sad that the era of Maharajas is over. Mourned Sri Woodeyars demise like you. Menthya sasive looks yummy. This is something that i make when I recover after a sick spell!Somehow this dish seem to cleanse my palate. I have a doubt... Can we use pre-soaked fenugreek seeds to quicken the process? Or will the frying in oil do the trick? Thanks for stopping by. Pre-soaked seeds tend to change the taste. Roasting them thoroughly gives the methi flavor in this curry. 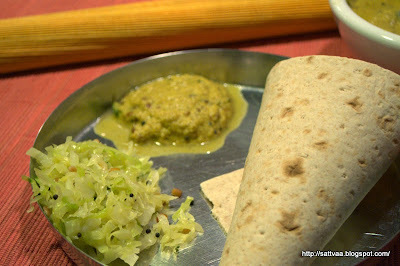 It doesn't take too long to cook but like some of the dishes (puliyogare etc), this saasive tastes better after a while.